While Google did skip October, platform version numbers are back, this time for November. Back in September we saw KitKat's gains continuing, and this month seems little different - in the two months since September, KitKat added another 5.7%, or about 2.8% per month. This is a slightly decline in pace, to be sure. 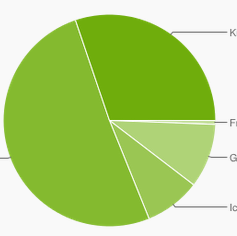 In September, KitKat added 3.6% in a one-month timespan, so 7.2%+ would have been needed to maintain that pace.